Read 'Em And Leap: Can We Build It? Currently there is a lot of construction going on next door. The neighbors are building a new house. So far we've witnessed the destruction of the old home, and now we're onto the new building phase. My sons could not be more pleased with the happenings over there. They are fascinated with "construction dudes" and "worker men" not to mention the trucks and vehicles! So on a rainy day, we decided to build a house of our own. 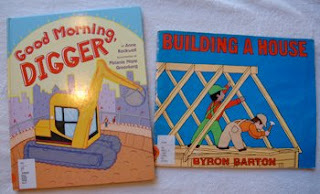 BOOKS: We found Building a House by Byron Barton at the library last week, and we read it multiple times a day. 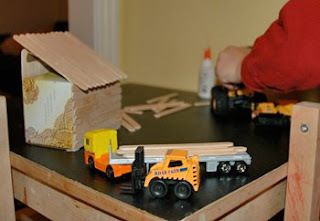 It's very simple with minimal text, but my sons love to see the steps made in building the home. We also have Good Morning, Digger by Anne Rockwell from the library right now. We've checked out this one several times, and my boys like this story about the construction of a community center seen through a little boy's eyes. 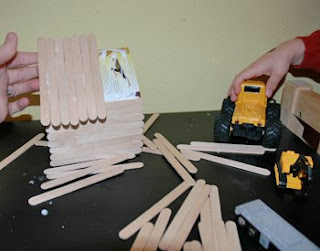 ACTIVITY: Popsicle stick house. 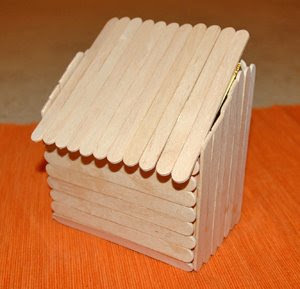 We happened to have a bag of wooden Popsicle sticks in the craft box. 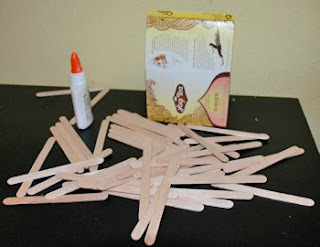 So I emptied out a box of tea bags, and I let my three-year-old start gluing the sticks to the box. I helped him get things laid down evenly, and I also had to keep my 15-month-old from grabbing it when the glue was still wet. (This would have been an easier project while my younger son was napping.) My son loved pretending he was on a job site. The flatbed delivered the sticks, the forklift took them off the truck, etc. 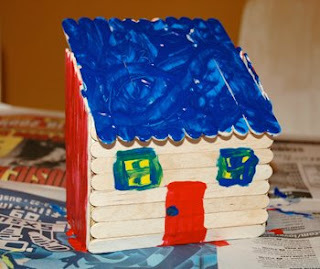 We let the house dry completely, and then my son painted it. He had a great time with this activity and a lot of patience with it, as well. In fact, he wanted to build another one the next day. Thanks for all the great book ideas! 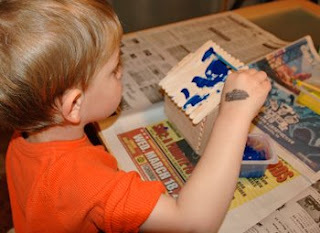 I'm looking forward to my son being a little bit older so we can start doing the art projects. Take a leap with us and go on a reading adventure! These are simple activities for young children paired with easy-to-find books. With a background as a producer of award-winning children's educational websites, I am happy with my current dream job as stay-at-home-mom of three young boys. I love the everyday activities that my boys and I cook up. I just wanted to share our fun and archive our learning experiences. This is not rocket science. This is simply my way of expressing our JOY OF READING!